The first CD I ever burned myself was actually a dub of one of my all-time favorite mix-tapes. Teen Idols: Greatest Pop HIts of the 80’s Vol. 1 was given to me by my film school friend, Steve, and it featured 25 songs taken from rare singles—many of which may never be converted to 1’s and 0’s. Many of them still come up empty when typed into a Google search. Many of them, most people have never heard before, and it’s a shame. I featured a few bands off this disc in the first incarnation of the HMSOD that was e-mail only: Dolly Mixture, Annie & The Aeroplanes, and The Wishing Stones. Like these three, most of the other bands on the tape released a few singles — maybe an LP or two — but for the most part remained pretty obscure. Except for one. And they, eventually became one of my all-time favorite bands. ﻿The Triffids (Yes, as in The Day Of…) began making music in Perth, Australia in the late ’70’s and by 1981—before they had even released their first official 45—they had semi-professionally recorded and released seven cassettes of original music. Over the next 13 years they would release just as many full-length albums and 5 EP’s — all of which I have hunted down with a vengeance. The band broke up in 1989 and sadly, the cornerstone of the band, David McComb, passed away ten years later at the age of 37 thanks to the wonders of heroin. attempt to explain the complexities of love by comparing relationships to a motion picture production company. It was definitely a hint of the great tunes to come. 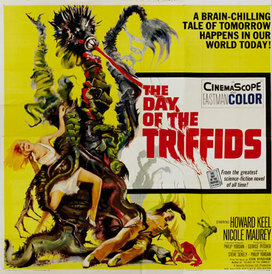 Thanks Steve, ﻿﻿for ﻿“MGM”﻿ by The Triffids, today’s Happy Medium Song of the Day.